While Britain debates the prosecution of cot-death mothers in the wake of the Trupti Patel case, history points to a Victorian parallel. In the 1800s, the hot topic for doctors and judges were the hundreds of new mothers who killed their children while apparently in the grip of post-natal madness. Their sympathetic approach to these women paved the way for liberal legislation that is still in place today to protect women who suffer severe mental illness after they give birth. Puerperal psychosis is now a well-recognised event, affecting perhaps one in every 500 births in the UK. It normally happens in the first month of the new child's life, and takes the form of a severe episode of mania - similar to that suffered by manic depressives. Patients may become confused and delusional, and in the most extreme cases try to harm themselves or their new child. Thankfully, such deaths are extremely rare as most cases are spotted early and women admitted to hospital. In the 1800s, however, Britain suffered an epidemic of child-killing blamed on "puerperal insanity". It accounted for as much as 15% of female asylum admissions in some years. Historian Dr Hilary Marland, from the University of Warwick, recounts one entry in the Journal of Social Science which said that the police "thought no more of finding the dead body of a child in the street than picking up a dead dog or cat." 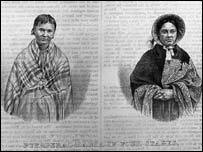 Many of the women involved were from the lower classes - and many of the babies were illegitimate. However, pleading this form of temporary insanity when taken to court was frequently met with a sympathetic response from judges, despite the obvious suspicion that some cases were murders. Dr Marland, who is writing a book on the subject called "Dangerous Motherhood", said: "In the 19th century doctors were more willing to accept that this was due to mental disturbance following childbirth. "This was more easily accepted in court. "There was this idea that these cases were an affront to motherhood, which they held in very high regard. "But there was the thought that it could be put right." 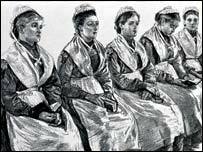 Many of the women were sent to local asylums to be treated over a period of months. Five women condemned to imprisonment for life for infanticide. Conditions at these were much better than in prison - many of the poorer mothers put on weight and became healthier during their confinement. The law was changed to accommodate such women, with the introduction of the Infanticide Act - creating a whole new legal definition of this kind of killing. The Victorian leniency towards infanticide was shaken by a case in 1865 when a women from London, Esther Lack, killed her three children by slitting their throats. After the court backed an insanity plea, one newspaper openly questioned the willingness of courts to find in favour of such defendents. However, Dr Marland claims that, in fact, the response to puerperal psychosis was more sympathetic in Victorian times than during most of the 20th century, or even today. "Sadly, today the condition is commonly undiagnosed and sufferers lack the sympathy, support and understanding needed." However, Dr Roch Cantwell, a researcher in perinatal mental illness at the University of Glasgow, says that the courts remain sympathetic in this country to obvious cases of infanticide. "These women are often charged with manslaughter on the grounds of diminished responsibility - but the sentencing available to the judge is more or less exactly the same, and people are more familiar with this charge. "However, I think the police and courts show great sympathy to women in this position." This is not the case everywhere - for example a case in the 1990s of a British woman whose baby died shortly after she gave birth in a New York hotel room. When the police suspected she had killed the baby - even though Ms Beale denied this, the courts refused bail and sent her to the notorious Riker Island prison for eight months awaiting trial for murder. She eventually was allowed to plead guilty to manslaughter and to return home. Other women have been given long jail terms in the US for offences that would be classed as infanticide in the UK. Fortunately, the prospects are good for any woman whose symptoms of psychosis are spotted, and women are highly unlikely to harm a baby, or themselves. Dr Cantwell told BBC News Online: "There are a range of drugs which are extremely effective, and complete recovery follows in most cases within one to three months." However, the fact that women spend less time in delivery wards than in previous decades means that the risk of warning signs being missed is higher, he says. "What needs to happen is that all the medical professionals involved with the mother ask the right questions at the right times. This is the best way of detecting potential cases."